Click the Export Data button, in the top right. 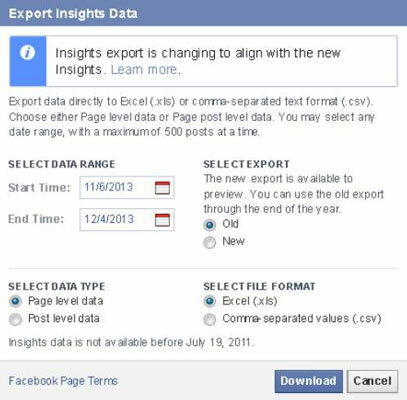 The Export Insights Data dialog box appears. Select the start and end dates to export. Select the type of data. Choose page-level data or post-level data. Page-level data just gives you numbers based on your business page’s overall interactions (for example, overall Likes, Unlikes, and friends of followers). Post-level data includes numbers directly related to individual posts (for example, name of post, date posted, and total number of followers that the post reached). Save your export file as an Excel spreadsheet () or a comma-separated values () file. Export Insights data periodically as a backup. In 2010, Facebook changed the way it displayed Insights. When it made the change, you couldn’t access any data from the previous version. If you hadn’t exported it, you couldn’t access it. Because Facebook periodically changes things, and it owns everything on the platform, you should keep your own backups to reference, just in case.